It is nearly New Years Eve and we are always looking for fun ways to celebrate New Years as a family. 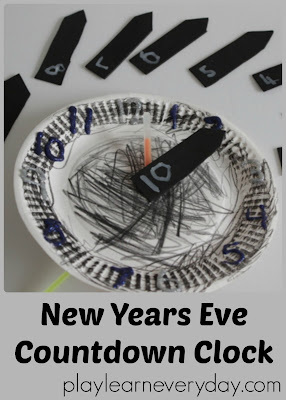 As Ethan is learning to tell the time we thought that it would be fun to make our very own New Years Eve Countdown Clock craft. To start with Ethan coloured his paper plate all black using the crayon and coloured pencil. (This would also work very well with black paint, but we didn't want to wait for the paint to dry). Next I used scissors to poke a hole in the middle of the plate for the clock hands to go through. Then we looked at a clock together and talked about where all the numbers are placed, and Ethan decided to write the big numbers in silver glitter glue and the other numbers in blue glitter glue. We worked together to write the numbers with the glitter glue in the correct spots. While the glitter glue was drying we made the hands for the clock. We used glow sticks as the clock hands, and to add to the fun we made some arrows to go on the clock hands that would also be our countdown numbers. Ethan cut the arrows out of black foam sheets, tracing the shape and using his scissors to cut them out. Then we stuck the glow sticks through the hole in the middle of our clock and it was ready to play with, making different times for Ethan to learn and ready to use on New Years Eve to countdown till the New Year. Or pin this idea for next year!